The meaning of "highly sensitive" was first used by Elaine N. Aron, Ph.D., in the early 1990s. Aron, who has written many studies and books on high sensitivity, including The Highly Sensitive Person, also created a personality test (which you can take here) to help you make sure that you are (or aren't) highly sensitive. Recently, more and more people are interested in the subject of introversion and the personality traits sensitive people have. Take a look in Susan Cain’s book “Quiet”, for example. Aron also notes that many people refer to the highly sensitive ones as "the minority". However, “minority” isn't something bad. On the contrary, highly sensitive people are different in a good way, since they are characterized by many positive traits. 1) They take things personally. That can be bad for some people, but it's not. Actually, highly sensitive people tend to understand others better and they are also very helpful! According to a research, sensitivity can be perceived as an asset or a negative trait, depending on the culture. For example, in Thailand and India, highly sensitive people are almost never teased. In North America, things are completely different. 2) They avoid team sports. Highly sensitive people prefer exercising on their own because they don't want to feel like everyone is watching their every move. Most highly sensitive people tend to occupy with individual sports, like bicycling, running and hiking. Nevertheless, we need to understand that this is not what always happens; there are many highly sensitive people who like to participate in team sports. That may be related to how their family supported them when they were kids. In fact, highly sensitive people can feel in a deeper way than the ones who are less sensitive. They tend to process things really deeply. As Ted Zeff states: “They’re very intuitive, and go very deep inside to try to figure things out.” Ted Zeff, Ph.D., is the author of The Highly Sensitive Person’s Survival Guide and other books on highly sensitive people. 4) They tend to react more in tough situations. 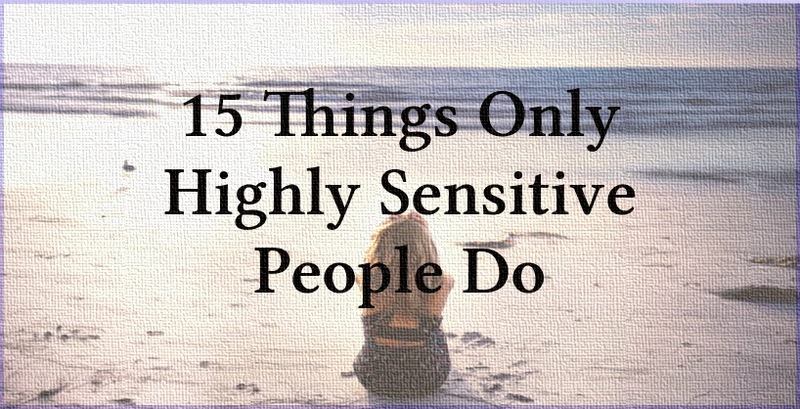 Highly sensitive people are also more reactive. They act with empathy when they listen to a friend's problem, for example. In addition, they seem to care more about others' reactions in case something bad happens. 5) They are not too spontaneous. On the contrary, highly sensitive people have a hard time making decisions, since they want to check every single detail. This may sound a little anxious, but in fact, careful decisions can save them from a lot of trouble. As Aron writes in a recent issue of her Comfort Zone newsletter, highly sensitive people can find it easier to make a decision by following some steps: "Take as long to decide as the situation permits, and ask for more time if you need it and can take it. During this time, try pretending for a minute, hour, day, or even week that you have made up your mind a certain way. How does that feel? Often, on the other side of a decision, things look different, and this gives you a chance to imagine more vividly that you are already there." 6) That's why they hate it when they make a bad decision. Highly sensitive people get really annoyed with themselves when they realize that their decision was "wrong" or "bad", according to their criteria. As Aron explains, the reason why highly sensitive ones can't stand making a mistake is that "the emotional reactivity is higher". 7) They are very observant. In fact, highly sensitive people tend to notice every single detail in a room by the moment they walk into it! 8) People think they are introverted... But not all of them are! As Aron states, only 30 percent of highly sensitive people are extroverts. What is essential about them is that most of the times these sensitive but extrovert people have grown up in a close-knit community and had the chance to interact with many people. 9) They can cooperate really well. As we previously said, highly sensitive people are really careful and watch every detail. That's why they are also perfect workers. They make good decisions, can take great responsibilities and they are really thoughtful. For example, if a highly sensitive person worked in a medical team, they would be great in counting the positive and negative reasons why a patient should or shouldn't have a surgery. 10) Unfortunately, many of them suffer from anxiety or even depression. But that's true only for those who've experienced something bad. According to Aron, "If you've had a fair number of bad experiences, especially early in life, so you don't feel safe in the world or you don't feel secure at home or ... at school, your nervous system is set to 'anxious,'". Being surrounded by supportive family members and friends can really help a highly sensitive person face his anxieties and fears. "You can't over-protect them, but you can't under-protect them, either. You have to titrate that just right when they're young so they can feel confident and they can do fine", Aron explains. 11) They get annoyed more easily. ... especially if it is an annoying sound. Well, everyone hates annoying noises more or less, but highly sensitive people are even more "fragile" when it comes to this. As Aron explains, that happens because they tend to be more easily overwhelmed and overstimulated by too much activity. 12) They hate violent or horror movies. We all remember that friend who's always whining: "Please, let's watch another movie! I won't be able to sleep at night!". Empathy and overstimulation can explain this situation too. You may call them fearful but they've got stronger emotions than you have. 13) They cry more often. As Zeff underlines, highly sensitive people rarely put themselves in situations where they will be made to feel embarrassed for crying easily. What their friends and family need to understand is that crying easily is not a sign of weakness but a form of expression. In other words, highly sensitive people let it all out. Crying can really make you stronger, because you get rid of all that made you feel bad. 14) They are very kind. Highly sensitive people are also highly conscientious people, Aron states. That's why they will probably be considerate and exhibit good manners. They also tend to notice when someone else isn't being conscientious - and they disapprove it. 15) Criticism can affect them a lot. Highly sensitive people have reactions to criticism that are more intense than less sensitive people. That's why they may employ certain tactics to avoid said criticism, including people-pleasing, criticizing themselves first, and avoiding the source of the criticism altogether, according to Aron.